My precious 13 1/2 year old toy poodle Muffin Bordeaux, went blind approximately two years ago due to cataracts. I was devastated, since he kept bumping into walls and falling down the stairs. He became very depressed and was afraid to move around. I could not let him out of my sight and carried him around everywhere. I searched the internet extensively for solutions/assistance. 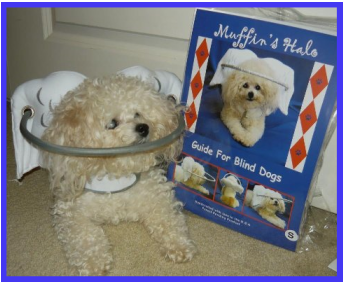 That was when I realized that there is a great need for products to assist blind/visually impaired dogs, so I invented this device/guide, “Muffin’s Halo Guide For Blind Dogs ® " that has changed his life, as well as mine. Muffin now knows his home again and can travel with me to any hotel or friend's house and gets to familiarize any new surrounding, quickly. He just loves this aid and is back to his peppy confident self! Muffin also loves all the attention he gets when I take him on walks, as he looks like a little angel. Most importantly, I can leave him at home for hours and know that he is safe. As Muffin (who recently went blind and was traumatized in the Emergency Room with complete strangers) was in critical care fighting for his life, I was on my knees sobbing all night. I was surrounded by his bed, toys and clothes and pleaded to God to please save my precious dog. I promised in return, upon his recovery, Muffin and I would be of service and dedicate our lives to helping blind dogs. 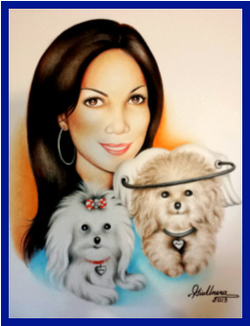 My greatest prayer was answered and after many weeks of tender loving care, Muffin recovered and I have since worked on and developed “Muffin’s Halo Guide For Blind Dogs ® ” to now make it available for other dogs facing this issue. I was stunned to find out how many dogs are abandoned or put down because they go blind. 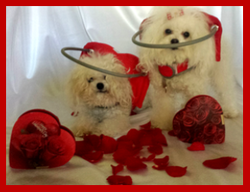 Muffin’s Halo can now save the lives of many dogs! It no longer has to be painful for the dogs and their owners, as I have a great solution to help this transition. 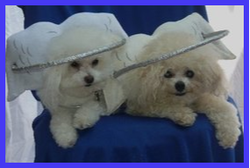 Today, Muffin’s Halo, my patented guide for blind dogs that was custom designed and handcrafted in the USA is now on the market. It is my greatest wish that we improve the lives of as many blind dogs as possible!